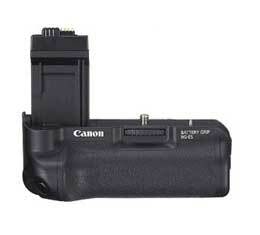 A vertical control battery grip designed for the Canon EOS Rebel XSi (EOS 450D). Slotting into the battery bay, it is able to take 6 AA batteries or two of the XSi's new LP-E5 batteries. It provides a shutter button and control dial along with AE/FE Lock, exposure compensation and AF point selection buttons in a vertical orientation. The Canon BG-E5 offers creative flexibility by providing a stable grip for vertical as well as horizontal positions.